If you need to accelerate your sales pipeline and generate leads for your business with custom content tailored to what customers need at each stage of the purchasing journey, Braden Kelley can create an inbound content marketing strategy for you or populate your current strategy with commissioned content (including white papers, webinars, or articles) – please contact us. Steve Bonadio, Head of Marketing & Product Marketing, InnoCentive, Inc.
Every company begins as the nimble startup, organized around the solution to a single customer problem and executing that solution better than anyone else in the market (including incumbents with deep pockets). But this emerging leader soon becomes a follower as the organization evolves and scales into a more complex (but capable) next generation incumbent. Inevitably, every growing organization finds itself so focused on capturing all of the business for its existing solutions, that it finds itself becoming disconnected from evolving customer preferences. So, what’s the solution? Unfortunately, when it comes to fostering continuous innovation, most organizational cultures stink at it, and they are not innovating fast enough to repel the unrelenting threat posed by new market entrants with declining barriers to entry. This is why I created my latest innovation success guide in partnership with Planview to help organizations learn how to make their organization’s innovation culture stink less. 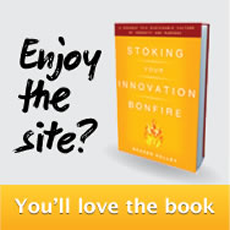 Download it now and get to work on transforming your innovation culture and infrastructure! Authored by industry thought leader Braden Kelley and following on the heels of a recent webinar (link to recording) on the same topic, this success guide explores the intersection of talent management and open innovation strategies. The paper dives into why having an external talent strategy is becoming increasingly important and how it can help your company accelerate innovation, shows how leading organizations manage their open innovation and crowdsourcing efforts (including case study examples of companies like P&G), and provides proven strategies and steps to take for attracting talent to your organization’s innovation efforts. There is a war for innovation brewing, and building a deep innovation capability is the only way to win it. The question is, will you lead the charge onto the innovation battlefield, or will you let your competitors bring the fight to you? As an increasing number of industries become commoditized, innovation has become an important way to distinguish your company from the competition, and a necessary investment just to maintain your existing market position. 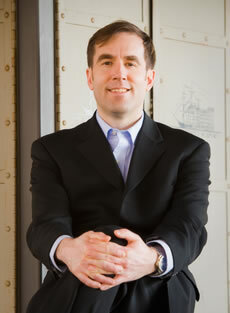 In this thought paper, Braden Kelley of innovationexcellence.com leads the charge against the status quo. He explores how your organization can stay relevant, grow, and thrive with an innovation framework that addresses four key areas: Leadership & Structure, Processes & Tools, People & Skills, and Culture & Values. If we take a lot of the best practices of innovation excellence and mix them together with a few new ingredients, the result is a simple framework organizations can use to guide their sustainable pursuit of innovation – the Eight I’s of Infinite Innovation™. This new framework anchors what is a very collaborative process. In this success guide we will look at the framework and some of the many points organizations must consider during each stage of the continuous process. In our digital age, all companies must change how they think, how they interact with customers, partners, and suppliers, and how their business works on the inside. Customer, partner, and supplier expectations have changed, and a gap is opening between what they expect from their interaction with companies and what those companies are currently able to deliver. Companies must immediately work to close this expectation gap, or their entire business is at risk. This success guide provides questions and frameworks for companies to use to plan and execute successful a Digital Transformation. This success guide examines the role of the Social Business Architect in helping to drive overall business success. Business Architects have the opportunity to plan for the organization how work can move from mystery to heuristics to algorithms to code. Business Architects (or people filling this role in an organization) have the opportunity to redesign work in the most efficient way possible to leverage both man and machine to get the work done at the lowest cost possible. Technology now exists to allow Business Architects and managers to move beyond allocating work on a job, project, or process basis, and instead design flexible workflows that combine the use of humans and machines to complete the tasks that they are best suited for, or even for humans to augment the work of machines. Thank you for your interest in the thought leadership of Braden Kelley! 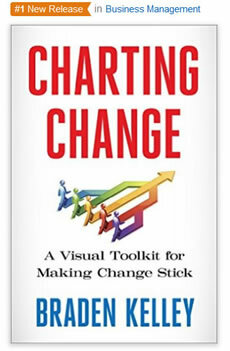 Be sure and check out the other available downloads and the Change Planning Toolkit™ introduced in his latest book Charting Change. 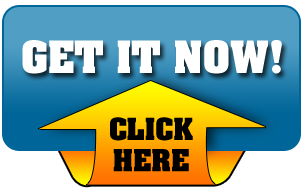 Be sure and check out the other available downloads and the Change Planning Toolkit™ introduced in the new book Charting Change (Feb 2016).